Bye bye, Best Buy, bye bye. Don't cry baby, there'll be a fire sale! Budget tablets - are they worth the saving? We have now stopped monitoring stores for regular changes. Touchpads can still be obtained, but not quite for the bargain basementr prices that were in place for a while during summer 2011 as Hewlett Packard lurched from one strategy to another. 16:55 - HP may be having a change of heart (maybe best call it another change of heart). It seems that those who sign up as WebOS developers (for free) can then get a discounted Touchpad. (£130 in UK, €150 in Europe (both inc. VAT) and $149.99 (USD) for US and Canada). This is the place. 10:32 - They have now announced that they will be producing more product to meet demand in the US - and they will 'share updates on regional availability as the information comes in' [Press conference here, via thinq]. We'll let you know if any new UK stock is planned. 15:23 - So it looks like if you haven't got a one by now you're out of luck. Who did you get closest with? Amazon, Dixons, Argos? How many of you bought TouchPads early and are now worried you won't be able to get a refund of the difference? Let us know in the comments. 12:13 - Remember to scroll down if you want to make a comment on any aspect of the debacle. How many of you had orders cancelled from Amazon yesterday..? 12:10 - I've been informed by @pandash on twitter that HP confirmed on the phone that this second wave is not the case for the UK..
11:01 - Reported on their Q+A blog that the official site as well as local retailers are only 'temporarily' out of stock: 'We will have more available shortly' - however this is on the US site so its not clear whether it applies to the UK too. But there's definitely a glimmer of hope - don't give up, keep checking this page for updates! In a relatively surprising turn, HP has revealed that it is 'discontinuing operations' for any devices running its operating system WebOS - including its TouchPad tablet. This 9.7" slate was launched only a few short months ago, so there will be a number of disappointed customers finding themselves over £300 out of pocket with an 'orphaned' tablet. A high level of competition in markets such as that for tablets is pushing margins down, and it seems that HP isn't content with following the trend. The discontinuation of the device is part of a broader market shift by HP away from consumer-electronics-for-the-masses and towards providing higher-margin business services. Specifically, it appears that the TouchPad just didn't quite cut it in an already saturated market. With low sales not meeting internal targets, the discontinuation is simply an admission that HP was never in a position to really stake a claim to any significant portion of a hugely dominated market, with plenty of rivals trying their hardest to grab just a fraction of the iPad's share. It's become clear that the TouchPad just wasn't quite good enough- its specs were nothing spectacular, and maybe more importantly, the WebOS platform failed to entice developers into giving their apps support for the software. As a result, its discontinuation by HP could be seen as a brave move against losing more money than it already has from a tablet that never really looked like taking off. HP's exit method of choice has been, in the US at least (so far), to contact each retailer selling the device, instructing them to get rid of the stock at only $99. A similar price drop occurred in the UK, to £89 and £105 for the 16/32GB models respectively in various retailers from Monday afternoon - a wild few days followed but all seems to have settled now with every major retailer out of stock. At these prices it was definitely worth trying to get hold of one. The webOS has indeed gained a number of fans and supporters for its intuitive and attractive interface, and HP will no doubt be looking for any takers to license the software or even buy it outright. In fact, the HP TouchPad even made it onto our almost-recommended list of tablets. It is also likely that developers will try and install Android 3 (Honeycomb) on the device, since at this knockdown price the spec list is more than capable of running Android speedily. 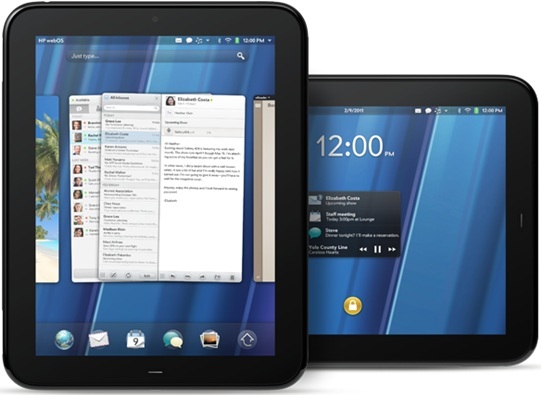 A WebOS executive has recently stated that "We’re going to obviously take care of every TouchPad customer". Whether this will come in the form of compensation, returns or otherwise is yet to be known.